Tim Tebow has been at the center of several dramatic Denver wins this season. 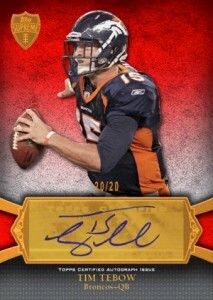 Topps is highlighting these victories with a new set of autograph inserts in the upcoming 2011 Topps Precision Football. Tim Tebow Precision Comeback Autographs are all redemptions. Every card is numbered to nine or less and spotlight individual performances, including the wild overtime playoff win against the Pittsburgh Steelers. 2011 Topps Precision Football is scheduled to be released on January 25th.